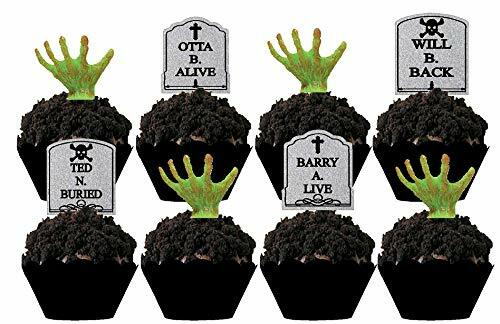 Halloween tombstone Picks bu CakeDrake. 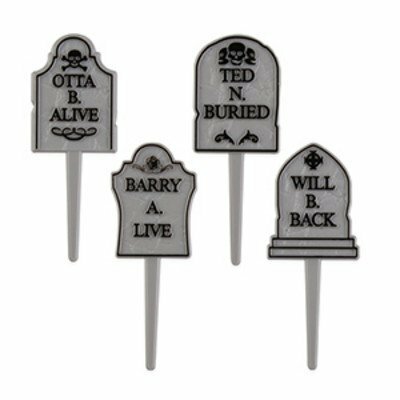 12 pieces of Halloween tombstone Picks. Picks are a fun cupcake topper for any Halloween party! Pick measures: about 1.5"w x 2.75"h. Halloween cupcake picks come in 4 assorted designs. Made of food safe material. 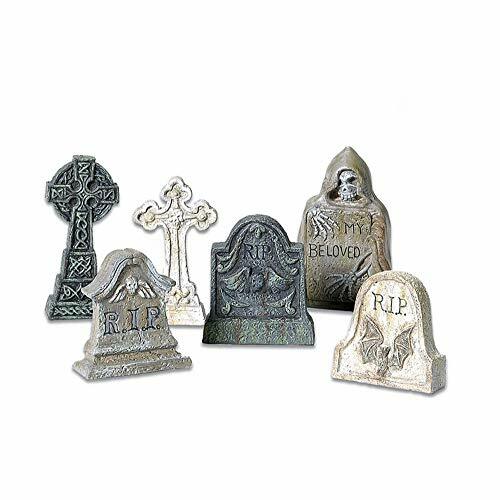 Make individual Halloween and Witchy treats using this 6-Piece Tombstone Silicone Molds Set. 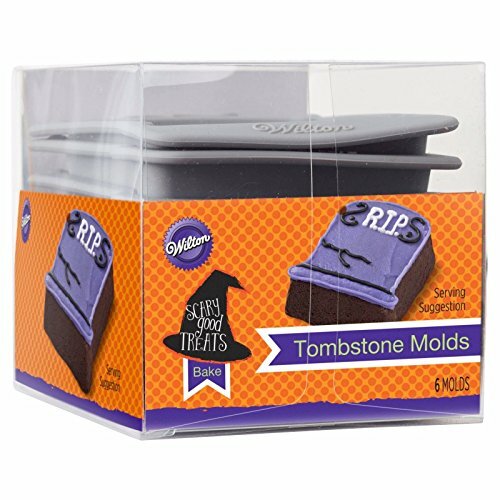 Silicone bakeware is oven-safe up to 500°F, perfect Halloween treats, like brownies, mini cakes and more. Also great for soaps, bath bombs, ice mold for punch bowl. Versatile silicone is also fridge/freezer safe, too. Flexible silicone makes it easy to "pop" treats right out of the mold. Dishwasher safe for easy cleanup. Perfect for ghoulish zombie parties as well! This Love Never Dies Wedding Skeleton Couple figurine/ Cake Topper is 6 1/8" tall, 2.5" long and 2" deep approximately. It weighs about 10 ounces. This sculpture is 7.25" tall, 3" wide and 2" deep approximately. It is made of designer composite resin, hand painted and polished. Because each piece is partly handcrafted, color tone may vary slightly from pictures. This lover never dies frankenstein couple is at the wedding ceremony giving each other a true love's kiss in the audience of all the living deads. This sculpture boasts of expert craftsmanship and paint job. 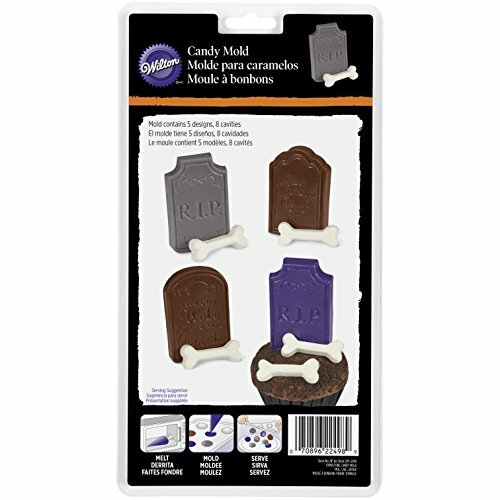 This Halloween candy mold features 5 designs: 4 grave marker designs and skeleton bone shape. Just melt candy in the microwave or melting pot. Pipe into the mold. Makes 8 candies. Serve candies alone or use them as festive treat toppers. Fun and simple cake for Halloween!